So, the moment I had been waiting for finally came this afternoon, I was feeling fidgety all day leading up to it and then by the time we got to the lakeland medical building where we were having the ultrasound done, it felt a bit surreal. We got there about 15 minutes early and were called back right away. Then the big moment the wand was turned on and a black and white image flashed across the screen and I saw a black circle with some whiteish shadows inside... but she didn't stay on the image long and told me she would explain everything at the end. So I laid there and waited staring at the screen trying so hard to decifer what I was seeing, but of course most of it just looked like black and white shadows. She checked both of my ovaries, and my cervix and then finally zoomed in on the sack and magnified things so we could see. 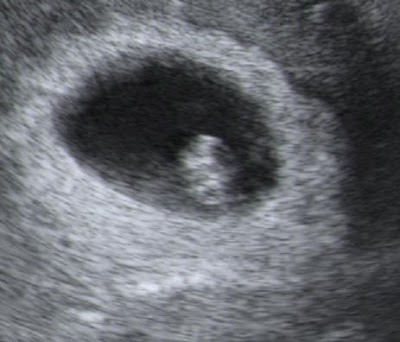 Inside the black circle was a BEAUTIFUL little white blob :) with an AMAZING little heart beating just like it should be (131 bpm), my heart felt like it would explode with happiness, I got teary eyed and stated breathing a little faster HURRAY, the baby looked awesome... and the big news is that we are further along than we thought, so today we measured 7wks +1 day, I'm not sure if the Dr will take that due date (Feb 26) or the one calculated based on when I think I ovulated which puts us at march 3. So We will see. My next Dr apointment is July 24 which will put me at 9wks +1 according to my new due date, or 8wks +3 according to my old one. Thank you God for hearing our prayers and helping our little Teddy Graham grow big and strong! You can see our precious little blob in this picture and if you look close you can see the outline of the yolk sack right above the baby.